So as I type the title for the nail of the day I realize they are both ocean/beach themed! How awesome is that?! We are definitely in need of a beach trip! How often do you guys get to go to the beach? Anyways we have obviously been into bright colors lately and these are two of our favorites. They both apply very easily and are opaque with 2 coats! Those are pretty! I need to get them. Haha. Oh, and today while I was at Walgreens I found a polish that looks like a dupe for the Nicki Minaj "Fly" color. It's by Sinful Colors and the name is Savage. The only thing is it dries matte. Oh my gosh. I SO want Sally Hansen's Coral Reef!! those colors really match your skin tones! 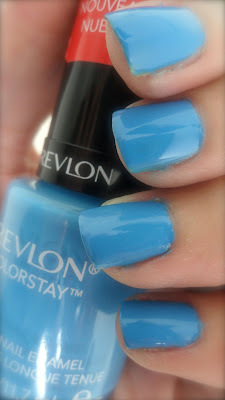 mostly the Revlon Colorstay - Coastal Surf! <3 u guys! I love the coral color, I just picked it up and can't wait to try it.